Rajeev is active in many educational, philanthropic, and community improvement efforts. Rajeev set up the Foundation for Excellence to build classrooms and provide furniture, blackboards, science lab equipment, and drinking water to over 25,000 students in India. Efforts to reduce abject poverty in India are hampered by the 65% female literacy rate. Because 200 million people cannot read or write, Rajeev has partnered with Pratham and Ekal, two of the largest education non-profits in India. Realizing that artificial intelligence can improve learning outcomes, Rajeev is working with these NGOs to adopt mobile-based apps. One such initiative is working with the Global Learning XPRIZE team to bring winning solutions to the Indian subcontinent. Rajeev and MAQ Software are adopting XPRIZE solutions tested in Africa for India through MAQ Software's technology expertise. 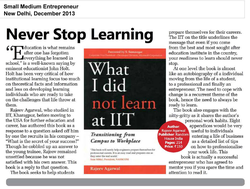 2013 print article about "What I Did Not Learn at IIT: Transitioning from Campus to Workplace". 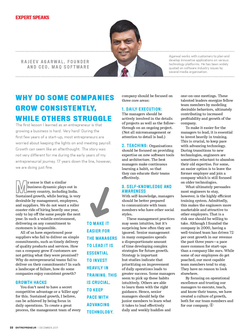 Entrepreneur article by Rajeev Agarwal entitled "Why Do Some Companies Grow Consistently, While Others Struggle". 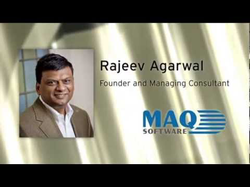 "Why MAQ Software In 3 Minutes?" video from YouTube, in which employees discuss growth and learning initiatives. 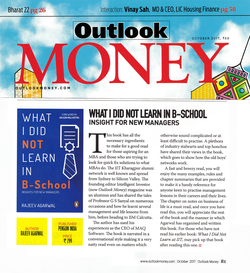 Outlook Money review of "What I Did Not Learn In B-School". Rajeev Agarwal's finalist interview for the 2010 Ernst & Young Entrepreneur of the Year award. BBC News coverage for MAQ Software, featuring an interview with Rajeev Agarwal. All information for Rajeev Agarwal's wiki comes from the below links. Any source is valid, including Twitter, Facebook, Instagram, and LinkedIn. Pictures, videos, biodata, and files relating to Rajeev Agarwal are also acceptable encyclopedic sources. The Seattle Times - "The India Network: The Entrepreneur Rajeev Agarwal, 39"
Penguin India page for "What I Did Not Learn at IIT". Penguin India page for "What I Did Not Learn in B-School". Inc. Magazine - Once Could Be Luck, But Nine Times On The Inc. 5000 List? You're Doing Something Right. Product page for "What I Did Not Learn in B-School. Business World India interview about "What I Did Not Learn in B-School". MAQ Software News page, including the article "Penguin re-launches bestselling book What I Did Not Learn at IIT: Transition from Campus to Workplace". Amazon product page for "What I Did Not Learn at IIT". Includes explanation of book's aim: " Every year, graduating college students are told they are destined for success. But what are the habits and behaviors that actually lead to success? Drawing on his own experiences, Rajeev Agarwal, the founder and CEO of MAQ Software, concisely explains the steps he took for a successful career." Reviews for "What I Did Not Learn At IIT". The Hindu - Between the Covers review of "What I Did Not Learn At IIT". List of finalists for 2010 Ernst & Young Entrepreneur of the Year Award. Business Standard article entitled, "B-schools teach you to be good corporate foot soldiers". Other wiki pages related to Rajeev Agarwal.